There are a few streets in the Alta Vista neighbourhood I still haven’t travelled down, so this morning I set off in that direction, destination Tweed Avenue. This is Tweed Avenue……………………………………………………… and this is tweed. Tweed is a rough unfinished woven wool – solid, hardy, not too risky. As a result of it’s rough weave, small variances occur, contributing in part to it’s endearing character. Same thing with Tweed Avenue, or rather this part of Alta Vista in general. Take, for example, the front yard on Colson Avenue shown below, completely covered in potted plants. Or this skate/bike sculpture on the roof of a mini mall. 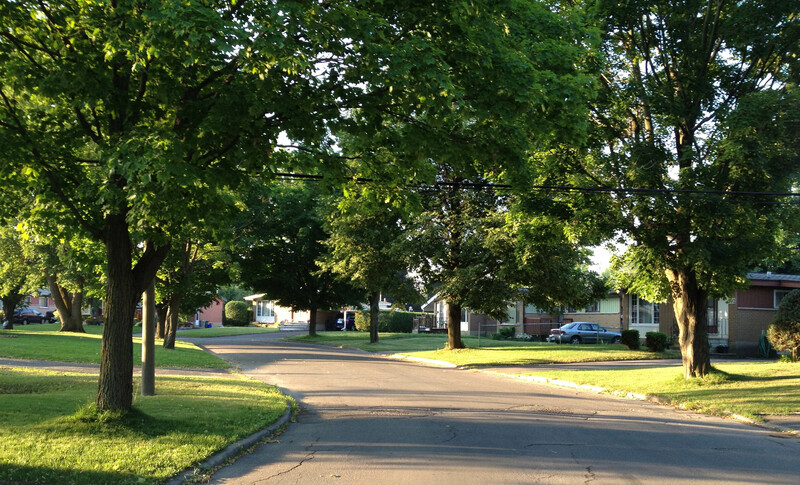 All of the streets I biked along in this area are shaded by hearty trees, which stand proudly in front of detached single family homes. Pleasant Park Road is different. For whatever reasons, perhaps because it is more of an arterial road, or maybe because the yards extend further back, it appears to be a more coveted street adress, as indicated by newer monster homes like this. All in all, a comfy part of town. Hunter green and pink – very 1988!